The What: The AtlasIED DPA Series multi-channel power amplifier line has been expanded with two four-channel, constant-voltage 70/100-volt models. 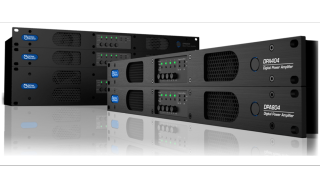 The new amps are designed for multi-zone distributed audio systems used in live sound reinforcement and building/emergency communication systems. The What Else: The DPA404 delivers four channels, each with 100 watts at 70 or 100 volts. It is also capable of 4x75 watts at 8 ohms. The DPA804 delivers four channels, each with 200 watts at 70 or 100 volts. It is also capable of 4x150 watts at 8 ohms. Both models are compact, taking up 1RU, and feature integrated digital signal processing, expansion slot for optional Dante audio transport card (DPA-DAC4) or a second card option (DPA-AMIX), providing four additional analog inputs. They also feature network control and GPIO for remote level or muting. The onboard DSP software is embedded in the amplifier and accessible via a web browser user interface. DSP adjustments include I/O routing, high- and low-pass filters, EQ, output level adjustment, delay, and limiter. Additionally, input mute for both audio sense and contact closure, level control link assignments, and port assignment and output impedance can be configured in the software. AtlasIED Site Manager software is also available that allows network administrators to see all DPA amplifiers on the network for easy identification, setup, and troubleshooting if necessary. The Bottom Line: AtlasIED designed the entire DPA Series line to be an installers "everyday use" amplifier for easy stocking. Each can be dynamically configured to handle either constant-voltage or conventional loudspeaker installations.